Jewish Facts From Portland: The Tribe of Dan and What Happened to the 10 Lost Tribes? The Tribe of Dan and What Happened to the 10 Lost Tribes? Samson, our strongest man, was from the tribe of Dan. He was one of the Israelite judges, son of Manoah. He was born before Saul of the tribe of Benjamin became a king which was in the 11th century BCE. He was a Nazirite from birth, meaning for one thing that he was not to cut his hair or drink any alcoholic beverage. His hair was where he got his strength and courage and was capable of doing feats against the Philistines. Delilah, his love, a woman of the Valley of Sorek (grapes ?) , deceived him and told the Philistines where his strength came from, for a price.1100 pieces of silver. She then cut his hair for them. The Philistines held a festival in Gaza where they mocked him by having him, now a slave of theirs, to turn the prison mill for them. He ended his life by destroying the building and killing everyone there, including himself. The movie, Samson and Delilah came out in 1949 with Victor Mature and Hedy Lamarr. This certainly immortalizes the pair. The twelve tribes of Jacob were from 4 mothers, the sisters Leah and Rachel and their handmaids. Dan was Jacob's 5th son and his mother was Bilhah, the handmaid of beautiful Rachel, Jacob's first love. Reuben, Simeon, Levi, Judah, Issachar, Zebulun were the sons of Leah, daughter of Laban. Joseph and Benjamin were the sons of Rachel. Dan and Naphtali were the sons of Bilhah, and Gad and Asher were the sons of Zilpah, handmaiden of Leah. Gad had developed a warlike reputation. This made up Jacob's 12 sons. Dinah, daughter of Leah, was the only daughter. Moses conferred the priestly office on the tribe of Levi. This meant that Levi would not receive any land as they were to be teachers and would travel to each tribe and live there while teaching. To maintain the number of tribes receiving territory at 12, which was a sacred number, he divided the tribe of Joseph into the tribes of Ephraim and Manasseh, Joseph's 2 sons. Joseph was the son who had been kidnapped and taken away to Egypt where he rose in status to have a very high commission and be working just under the Pharaoh. He had remained in Egypt. 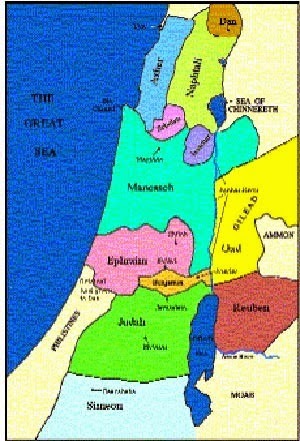 The Levites must have been divided up between the Empires of Israel and Judah- the North and the South. After the conquest of Canaan, Dan was allotted a portion south of Jaffa (today joined with Tel Aviv) , but was forced back into the hill country by the Amorites, and only a part of the tribe remained in the coastal region. The greater part of Dan was forced to migrate northward where it eventually wrested from the Phoenicians a settlement area around Laish (Judg. 8:27-9) On the map above it is shown as the farthest north in brown. It is also mentioned in the MAR1 tablets( or Leshem (Jos. 19:47), the name of which became Dan. The Danites had been expelled from their original inheritance by the Amorites so moved on to the sources of the Jordan River. "The tribe of Dan was one to be the avenger of his people. Dan would be the snake that bites those that would come to harm his people." Under Joshua's division of Canaan, Reuben, Gad, and half the tribe of Manasseh received territory in what was later called Transjordan, now just Jordan. . Naphtali and Asher were placed on the Sidonian frontier in the Galilee. Issachar and Zebulun were settled in the Valley of Jezereel area. Ephraim and the other half of Manasseh were to live in the mountains of Samaria with Benjamin to their south. and Judah even further south. So Dan was to live basically along the seacoast around Jaffa and Simeon was placed in the Negev. The rest of the tribe of Dan's existence grew serious after the arrival of the Philistines. Samson was a hero of the tribe. The period of Saul and David helped. The northern part of Dan was the site of a temple (Judg. 18:26-30) at which the descendants of Manasseh or Moses acted as priests. This became one of the chief cult centers in the kingdom of Ephraim, and Jeroboam erected it it the image of a calf to deflect worshippers from the sanctuary at Jerusalem. Some other tribes also didn't succeed in occupying the entire areas assigned to them. Simeon seized further land in Seir and the territory of the Amalekites, a tribe of Caanan especially hateful of the Israelites who treated them horribly when they came through on the Exodus. It is said that Haman in Persia much have been from the Amalekites, and possibly Hitler was, too. Dan was captured by Ben Hadad of Syria during the rule of Baasha around 900 BCE .They would have been the closest tribe to Syria. This tribal division of the land was maintained under the period of the Judges, but King Solomon (961-920 BCE) changed the format of the division of land to suit his administration. When King Solomon died, the land of Israel split into 2 halves with the southern half going to the tribe of Judah and Simeon, sons of Jacob and Leah, and most of the tribe of Benjamin, son from Jacob and Rachel. So Jews of today come from these 3 tribes. Then, in 732 BCE, the Assyrian king Tiglath-Pileser invaded and took away people of Israel in the north as slaves. While the state of Judah was crippled from the loss of warriors, in 721-715 BCE the King Sargon of Assyria also attacked and took away more people as slaves. In all, 10 tribes had been exiled from the northern kingdom of Israel. The kidnapped population had gone mostly to Assyria, of course, but also had been sold to Media and the lands neighboring Aram-Naharaim. Our 10 Lost Tribes to us were mourned. This weakened the southern kingdom of Judah who were then attacked by Nebuchadnezzar of Babylon in 586 BCE and many were exiled. An Israeli communal settlement at the foot of Mt Hermon near the source of the River Dan was founded by pioneers of Romanian origin in 1939. It withstood a heavy Syrian attack in the War of Independence in 1948. Their population in 1990 was 554. Nearby is a tel, the site of the biblical city of Dan (Laish) which has been excavated by Avraham Biran. Modern Israel has a Soreq Valley and even a Sorek Vineyard (since 1994/5) producing Merlot. Soreq, however, is the grapevine itself in Genesis 49:11, Isaiah 5:2, and Jeremiah 2:21. Samson had been dedicated as a Nazirite, "from the womb to the day of his death"; thus he was forbidden to touch wine or cut his hair. 1. Eldad Ha-Dani reported them apparently in the mountains of Africa. 2. Benjamin of Tudela heard of them in Central Asia. 5. Shabbetai Tzevi appointed rulers over the various tribes. 7. Votaries of the Anglo-Israel theory place them in the Anglo-Saxon countries. After watching a travel show into Scotland and their food customs, I would say they had no connection to any lost tribe. They proudly proclaimed that hunting for their food was the best thing to do and ate bloody meat. Jews don't. Whatever traces showing of their connection are usually in the customs, so this doesn't comply. Actually as a historic fact, some members of the Ten Lost Tribes remained in the land of Israel and Judah, later after 135 CE to be called Palestine. Apart from the Samaritans, which is another case, some of their descendants long preserved their identity among the Jewish population. Others were assimilated, while still others were presumably absorbed by the last Judean exiles who in 597-586 were deported to areas adjacent to the place of exile of the Ten Lost Tribes which was Media, Assyria and Mesopotamia. Today Israel is receiving reports and taking in people claiming to be of the lost tribes of Israel, who were surprised to find that others thought them lost, as they knew where they were. The problem was that the Jews didn't know where they were and could not bring them back. India's tribe of Menashe, called Bnei Menashe, one of the sons of Joseph, has returned to Israel. 2,000 now live in Israel. In 2013, 7,000 more were waiting to return. 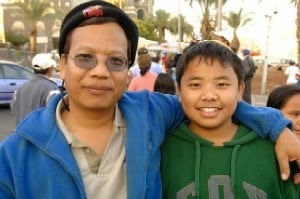 Bnei Menashe are also from Burma (Myanmar) Recently a return to Judaism began. Several thousand people of Menashe decided to observe the laws of the Torah and returned to Judaism. They have synagogues in Manipur, Assam, and Mizoram. There are also those who emigrated to Israel. Thousands long for returning to Israel.
" Several Christian organizations helped bring them home. "In fact, the Hebrew prophets said when God gathered His Jewish people back from all the ends of the earth in the last days that there would be Gentiles helping and bringing them back," David Parsons, with the International Christian Embassy Jerusalem, told CBN News." "India is also home to the Bené Israel, a group whose Jewish bona fides are not in question. India is also home to the Bene Israel, a group whose Jewish DNA is not in question. In fact, markers in DNA samples from the Bene Israel are consistent with descendants of a small group of hereditary Israelite priests or Cohanim—those descended from Moses’ brother Aaron. They now number less than eight thousand (most of them emigrated to Israel in the 1950s), but once, more than thirty thousand Jewish People lived in and around Mumbai (formerly Bombay). "That would be the dna Cohen gene of J1. "Some associate them with either the tribe of Zebulon or Asher because of their tradition of working as oil pressers and merchants. Others think they are Jews who fled persecution from various Arab governments. It is thought that the Pashtuns of Pakistan and Afghanistan could contain some of the lost tribes as they have a history of descending from Benjamin and Joseph. Some Maasais of Africa claim to be of the lost tribe. A few have returned. A group from Burma has as well. The Lemba tribe of Israel has been found to carry the Cohen gene. They even believe they have the ark of the covenant. "Ethiopians have finally convinced Israel's rabbis that they have Jewish roots. 65,000 have moved to Israel, starting in 1974. They say they are either from the tribe of Dan, or are descendants of King Solomon and the Queen of Sheba of Ethiopia, who had come for a visit to Jerusalem. DNA did not turn up any evidence of a Jewish connection, but they have been practicing Judaism up to a point in our ancient history. " They should have a few of Solomon's genes." Today those in Israel are having a hard time adjusting, especially with rioting Blacks in the USA on TV bringing out their similar problems of education and position. Anthropologist Shalva Weil of Jerusalem has documented differing tribes and peoples claiming affiliation to the Lost Tribes throughout the world. Dr. Shalva Weil is a Senior Researcher at The Research Institute for Innovation and Education at the Hebrew University. She focuses on Indian Jewry, Ethiopian Jewry, and the Ten Lost Tribes and specializes in qualitative methods, violence, gender, ethnicity, education, religion, and migration. "Shalva Weil has published widely on the Bene Israel, Cochin Jews, Baghdadi Jews, and the Shinlung (“Bnei Menasseh”)."" Weil has published extensively on the Ten Lost Tribes and in particular, the Beta Israel, the Bene Israel, and the Pathans/Pashtuns, as well as on Judaising groups all over Africa, China and elsewhere. In 1991, she curated an exhibition at Beth Hatefutsoth: the Museum of the Jewish Diaspora on the Ten Lost Tribes entitled "Beyond the Sambatyon: the Myth of the Ten Lost Tribes". She is on the international board of ISSAJ [International Society for the Study of African Jewry]"